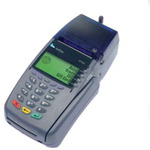 VeriFone’s RoHS-compliant Vx 680 is the latest in wireless credit card terminals. This terminal provides a wireless solution that delivers blazing performance, high-end functionality, and exceptional ease of use, without tying customers to a fixed location. Download PDF of the VX680 Terminal.